Brown rice is a complex carbohydrate and a slow-release energy source. 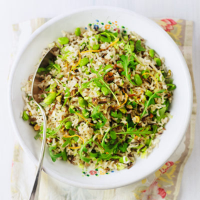 The rice, broad beans and nuts add flavour and texture to the salad and offer a host of essential vitamins and minerals. 1. Cook the rice in a large pan of water for 25 minutes. Add the beans and cook for a further 2-3 minutes until the beans and rice are tender and cooked. 2. Drain well and tip into a large serving bowl. Add the orange zest and juice and salad onions and leave to cool. 3. To serve, fold the pistachios and rocket leaves through the rice salad, and season to taste. Toasting the pistachios really brings out the fl avour. Spread out on a baking sheet and cook at 170°C, gas mark 3 for 10 minutes until golden.